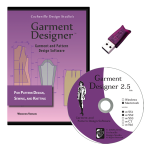 Garment Designer Demo downloads for past operating systems. Try it out for yourself! Please check the compatibility with your OS, as these are for older operating systems.These demos do not include the full capabilities of Garment Designer or Plug-ins such as Style Sets 1 & 2, but are intended to give the user a feel for the layout and how the program operates. If you do not see your operating system this means a demo is not currently available. Unzips to a working folder with program inside. You will need to create a shortcut. Decompresses to a working folder with the program inside. You will need to create an alias if you want one.